The Sigma 18-35mm f/1.8 rocked the Internet when it was announce. A zoom lens with an aperture of F1.8? WHAT! And let me tell you, it wasn’t just hype. This lens is beautiful. And don’t get scared off by the focal length, on an APS-C sensor this lens is perfect. Cost effective – $800 is not bad for a lens that is this fast. Fast – F1.8 is smoking fast for a zoom lens. Good range – With crop sensors the range is very usable. 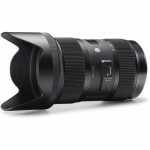 So much so, that I would consider recommending this lens over a 24-70mm as the best first zoom lens for beginners. Usable (somewhat) on full-frame cameras – While this is an APS-C lens, you can actually use almost half the range on a full-frame camera. So it becomes a 28-35mm F1.8 lens on your 5D. Range is limited – Not a big deal in my mind given it is made from crop sensors. No IS – Again, not a big deal considering Image Stabilization would add a good deal of cost to this lens. But it would be very nice. Very impressive lens, this would be a great beginner zoom lense. Big question is will any of you be shooting 18mm at f/1.8 outdoors? Anything that wide is typically set at f/5.6 or more. IMO, this lens seems great for indoor shoots like a wedding. Otherwise my Sigma EX f/2.8 24-70mm is my go to lens. And at that I try to stay around f/3.5 to f/4. However, it would be cool to have 18 f/1.8 indoors. Quick question…what is the bokeh like at 18mm f/1.8? Id love a part 2 of this review wirh more field tests, and zooms in the image to see if there’s any CA or lose of sharpness in the corners. I bought this lense a couple of weeks ago and i’m really satisfied! This lense is simply fantastic! Sorry if this is a silly question but I’m confused as whether to get the Sigma with the Nikon or Canon mount. I mainly use the Canon 70D but also have a few nikon bodies that get some use, but am ultimately wishing to upgrade to the gh4 in the future. If i want to try and future-proof my lenses which one should I get? Thank you for all your work, it has helped me immensely. Thats a tough one. Hopefully the Canon to Nikon Speedbooster will be out and you’ll be fine with a Canon version. If you’re moving to the GH4 soon I would wait on this lens till then. Caleb, can you suggest a store that carries it in Chicago? Sigma 18-35mm f/1.8 vs. the Sigma 17-50mm f/2.8? also, think of it this way, you’re buying 2 fast primes 24 and 35 at this price. i just put up my tamron and rokinon cine up for sale.